Washington, D.C. - ESF President Quentin Wheeler is among 1,219 governors, mayors, businesses, investors, and colleges and university leaders from across the U.S. or with significant operations in the U.S., representing the broadest cross section of the American economy yet assembled in pursuit of climate action, who this week declared their intent to continue to ensure the U.S. remains a global leader in reducing carbon emissions. Together, these leaders are sending a strong signal to the international community and the 194 other parties to the Paris Agreement about the continued commitment of the U.S. to ambitious action on climate change absent leadership at the federal level. In the aggregate, the signatories are delivering concrete emissions reductions that will help meet America's emissions pledge under the Paris Agreement. Signatories include leaders from 125 cities, 9 states, 902 businesses and investors, and 183 colleges and universities. Participating cities and states represent 120 million Americans and contribute $6.2 trillion to the U.S. economy, and include Oregon and cities such as New York, Los Angeles and Houston as well as smaller cities such as Pittsburgh, Pennsylvania, and Dubuque, Iowa. A mixture of private universities, state schools and community colleges, both small and large, have added their institutions to the statement. In total the undersigned businesses and investors account for a total annual revenue of $1.4 trillion and include over 20 Fortune 500 companies, including Apple, eBay, Gap Inc., Google, Intel, Microsoft, and Nike. In addition, hundreds of small businesses have also signed the statement. The statement calls the Trump administration's announcement one that "undermines a key pillar in the fight against climate change [and a move which is] out of step with what is happening in the United States." The signers all understand that the Paris Agreement is a blueprint for job creation, stability and global prosperity and that accelerating the United States' clean energy transition is an opportunity - not a liability - to create jobs, spur innovation, promote trade and ensure American competitiveness. 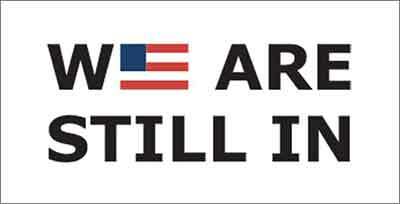 By declaring that "we are still in," the signatories are putting the best interests of their constituents, customers, students and communities first while assuring the rest of the world that American leadership on climate change extends well beyond the federal government. In addition to this statement, since President Trump's announcement to withdraw from the Paris Agreement, 211 "climate mayors" have adopted the Paris Agreement goals for their cities, 13 governors have formed the bipartisan U.S. Climate Alliance, and 17 governors have released individual statements standing by Paris. The latest statement embraces this rapidly growing movement of subnational and civil society leaders by announcing that not only are these leaders stepping forward, they are stepping forward together.